http://video.nbc5.com/player/?id=207982 Where is the shoring Maayor Daley? Lets all stand around and look at the broken water main at $80.00 dollars an hour. Yee haaaa.. Forget the Olympics Daley, lets fix the streets. Spatz gain lots of weight, must be from the stress of trying to get politicians to work. Wouldn’t that be more accurately the city taxpayers? Said taxpayers who’ve elected, or allowed to be elected, the very incompetent, dishonest, thieving rascals responsible for neglecting to do even the most meager of due diligence? The city has 16 crews repairing broken mains and eight crews working to replace outdated mains, Murphy said. Thanks to a hike in the city’s water rate, two more crews will be out this year replacing old mains, he said. Murphy said it took several hours to shut off the water after the flood because workers had to close 8 to 11 difficult-to-reach valves by hand until a special piece of equipment was brought in from another district to speed up the job. (Response) You are on the money! 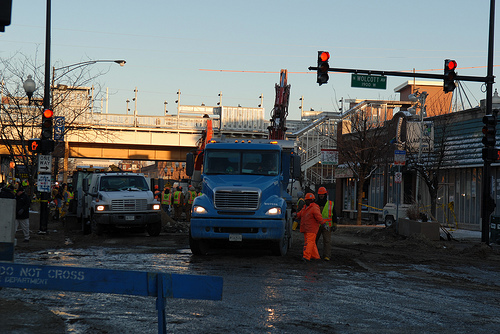 Although the city’s Department of Water Management regularly gets reports of leaks, the department received no such warning in the days preceding Tuesday’s water-main break and the sinkhole it opened in the Ravenswood neighborhood, officials said. “There were no complaints to prompt us to monitor leaks,” spokesman Tom LaPorte said Wednesday afternoon. The 100-year-old, 3-foot-wide iron pipe near Montrose Avenue and Honore Street burst about 1:30 a.m. Tuesday, causing the pavement to buckle and cave. The rush of water created a gaping hole 15 feet deep and 80 feet in diameter that consumed everything from trees to parking signs and meters. Vehicles parked on nearby roadways took on as much as 1 foot of water, and the basements of numerous residential and commercial buildings flooded. Businesses on the block remained closed Wednesday. Officials said Tuesday that it may take a week to repair the pavement. The foundation of a Mexican restaurant at 1825 W. Montrose Ave. separated from the footing, but the one-story building that also houses two other businesses should not need to be condemned, said Bill McCaffrey, spokesman for the Department of Buildings. “That portion is being repaired,” McCaffrey said. LaPorte said the city monitors a number of minor leaks at any given time. The process begins when someone reports water bubbling up from the ground at a place such as a sidewalk or parkway. After a report is filed, investigators assess the situation, LaPorte said. If the water is not causing an immediate danger and is draining into the sewer, the department schedules a repair at a later date and keeps an eye on the site. Officials also constantly register water pressures through computers at 12 pumping stations, LaPorte said. Just as there were no complaints about leaks in the area before Tuesday’s break, there were no significant changes in water pressure recently, LaPorte said. “It would take a fairly big break for a pressure problem to show up,” he said. i am amazed at the amount of people who are not speaking up about this crook we have as mayor. there is total fear on one side and an “I could care less” attitude on the other side. and daley just ram rods his band of merry men to do what he wants. he knows he’s untouchable by the local politicians because they fear him or he buys them off. I have been busy sending out emails to what ever sites I can find, including the inspector general. and I am demanding justice. everyone needs to get more involved. something needs to happen. listen, a lot of good has come to this city, but does that make it ok to trample on the middle class and jack up thier taxes. or does that make it right that daley’s son can steal from the city for his own benefit and then run off to the army to escape justice. The motto of the Crook County Democratic Party. Also the motto of the Repulsive Republican Party of Illinois.